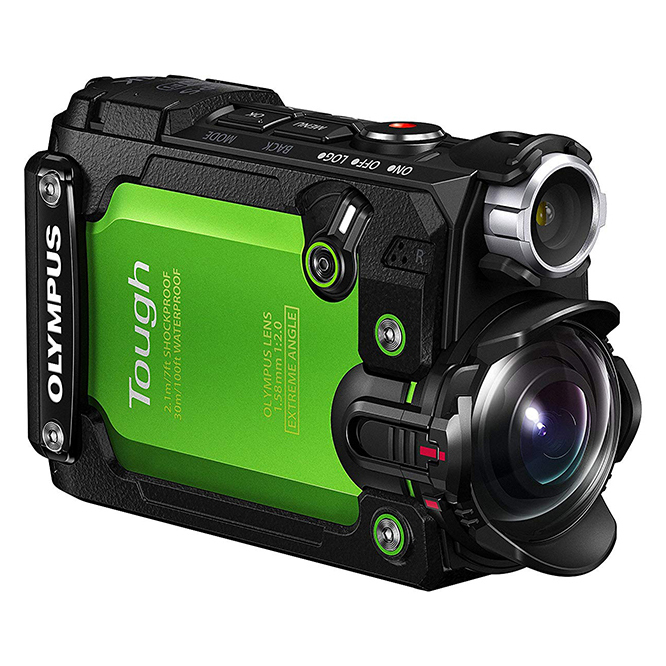 Olympus has experience and a reputation for making rugged cameras. Its Tough Series has amped up the competition as there are more rugged point-and-shoot cameras out on the market but the TG-Tracker is Olympus’ first true action camera. This model is one that stands out from the rest, simply through its design. Olympus decided to stray away from the commonly used box design and created a miniature camcorder with a flip-out screen. The design itself makes the TG-Tracker shine within the action camera market and with its features, this could be the go-to action camera to look into if you intend on buying one. As mentioned, the TG-Tracker’s exterior is different from many other action cameras. 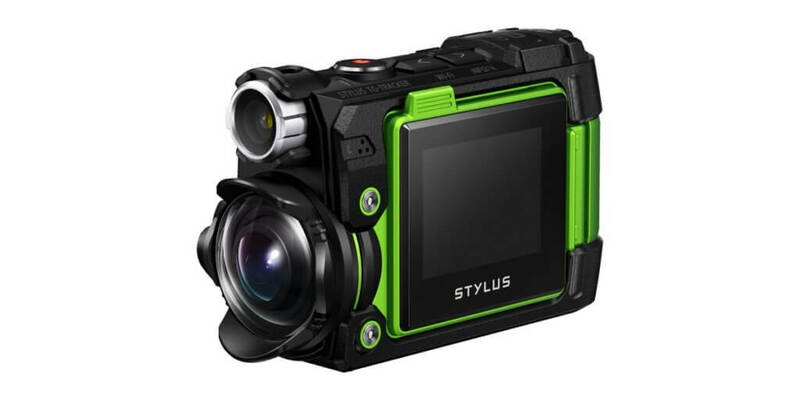 The small box design was thrown out and Olympus decided to innovate what the typical action camera can be. Even though the camera isn’t a tiny box, it is still quite small and only weighs a bit more than the GoPro Hero4 Black. Although the extra weight can cause more wobble when the camera is mounted on a handlebar, it has a built-in image stabilizer. This will need to be enabled through the menu system which does a fair job at reducing the vibrations. The camera was built to handle drops. It is said to withstand drops from up to 7 feet and is crush-proof up to 220 pounds. In addition, it is also waterproof – without or without the waterproof housing. Without housing, it can go about 100-feet underwater. Aside from its unique design, the colors of the TG-Tracker will catch your attention. It comes in an electric green which also different as many of the common colors are black or grey. But you also have the option of getting the camera in black. The TG-Tracker’s buttons and ports are completely sealed. On the back of the camera is a lockable hinged door that gives you access to the battery, microSD slot, and USB and HDMI ports. You can view and have access to the files on the camera with the Olympus Image Track (OI.Track) app. But if you just want to save the videos or photos, it is best to use the OI.Share app. A feature of this app is the “log” mode. When the data logging is enabled, the TG-Tracker records and saves the GPS and sensor data along with the content that was captured. Even when you’re not connected to the app, you can still see the videos or still images associated. With this, you must be aware of your location when you want to look back on your content. The OI.Track app automatically organized the media by the log data and you can only view videos after clicking a certain log file. Once you do that, only the media associated with that specific log data will be visible. The TG-Tracker can record in 4K at 30 frames per second (fps) but also has other resolution options like 1080p and 720p. There is also an option for high-speed recording that shoots at 720p and 480p at 240fps. This is ideal for slow-motion playbacks. You will notice that footage is normally well-balanced in exposure with lots of detail. But there might be some difficulty with contrast, which is normal with many action cameras. If you are moving from a bright to shade area, the exposure does adjust quickly. Like many action cameras, the TG-Tracker also has a wide lens but this one is actually wider than its competitors like GoPro. Its ultra-wide lens captures at a 204-degree angle where others capture at a 150-degree angle. This ultra-wide-angle might be beneficial for some as it can capture a lot of scenery, it isn’t ideal. With this large angle comes with extreme distortion and image softening on the edges. You can make the view narrow with its underwater mode but it does impact the visual quality, especially when shooting in 4K. The underwater mode crops the image to avoid vignetting while using an underwater lens protector. Olympus did a great job in creating a different type of action camera. It ventured out the typical box-shaped exterior and played around with various features. The TG-Tracker is definitely a durable and easy-to-use outdoor camera that can resist a lot. But the image quality isn’t the best on the market. If you intend on using the action camera to be mounted and allow it to be used hands-free, then you might want to look elsewhere.